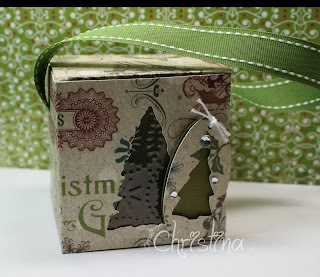 This week's Gypsy Spot challenge is Christmas gift packaging. I used Cricut cartridge "Tags, Bags, Boxes, and More" and the "Christmas" solutions cartridge to make the gift box. I created the window on the gift box using the the tree from the "Christmas" cartridge and added acetate that I ran through my Big Shot with the Cuttlebug embossing folder "Snow Dots". I also added a tag from the "Very Merry Tags" solution cartridge and dressed it up a little with some bling. Christina, this box is just so cute. TFS! Oh, that is just so pretty! Love the little tag too! This is super cute!!! LOVE it. I just love the Tags, Bags, and Boxes cartridge! This is so cute! I just love the box and the paper you used. Thanks for sharing. So very cute christina. I love the paper choice too. I love your box...you did a wonderful job just wonderful. Very cute package! How big is it? What a beautiful box Christina! I LOVE it! Very cute as well as a clever idea. Love the box and the acetate...just to cute. Thanks for sharing.